Ariel Toucan (Ramphastos ariel) is another of the smaller black toucans weighing approximately 350-400 grams. It has an overall length of approximately fifteen inches with a beak length of 4-6 inches. It is a colorful bird with its bright orange breast, red abdominal feathers, red eyeskin, and brilliant blue eye. 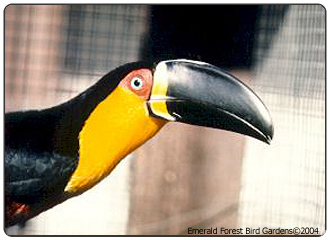 The Ariel Toucan is found only in Brasil south of the Amazon River, where it is a commonly encountered species. It is the species most frequently seen in Brasilian Zoos, as well. In captivity, the Ariel is almost non-existant, with probably no more Than a dozen birds spread over four collections.